Abu Dhabi Tourism & Culture Authority is finalising an activities programme which will bring the emirate alive during the 42nd National Day weekend running November 28th–December 2nd this year. Abu Dhabi’s stunning Corniche will burst with activity for the whole of the weekend with attractions and challenges for all – residents and visitors while women’s-only activities will run on Al Bateen Beach. Additional celebrations are being planned for the emirate’s heritage heartland of Al Ain and its Al Gharbia Western Region with concerts and fireworks on the drawing board for Delma Island and Madinat Zayed. “People can anticipate an action-packed weekend to satisfy the tastes of residents and visitors alike and which will undoubtedly make Abu Dhabi the place to be for the 42nd National Day. Visitors to the emirate will leave with lasting memories of celebrations which will have a distinctly traditional and Emirati flavour with most of the activities being free-to-attend.” explained Faisal Al Sheikh, director events bureau, TCA Abu Dhabi. On the drawing board are two mega firework displays along Abu Dhabi Corniche running for ten minutes each at 20:00 on December 1st and 2nd. 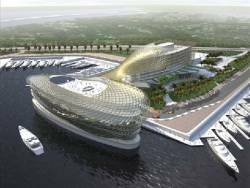 “We anticipate those stakeholders with Corniche-focussed operations will be able to package around this and look forward to hearing their ideas,” added Al Sheikh. Also in the pipeline is a huge car parade for December 2nd to be held on Yas Leisure Drive on Abu Dhabi’s entertainment district of Yas Island. “The parade is scheduled to begin at 17:00 but the fun will start much earlier – at `14:00 – with the car park around Du Forum being thronged with fun activities for all the family,” explained Al Sheikh. Over in Al Ain, the National Day weekend will also see aviation enthusiasts and families gather for the 10th Al Ain Aerobatic Show. “Again we are planning a show which will have an anniversary and Emirati feel,” said Al Sheikh.